From their humble beginnings playing at the tiny Roadhouse venue to selling out the largest indoor arena in Europe, Muse's meteoric rise has been phenomenal. 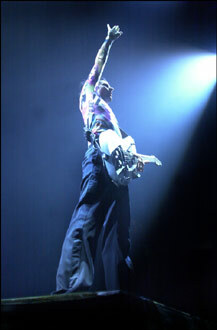 Their latest masterpiece "Absolution" rocketed to the top of the album charts with reviewers in universal agreement that the Devon trio had surpassed the genius of "Origin Of Symmetry". When it really comes to experiencing the full impact of Muse, you've got to see them live. Muse don't just play gigs, they perform shows to such an intense effect that you're in awe, in a state of bewildered euphoria and on the strongest legal high money can buy. The lights dim, melodramatic music pounds out of the speakers, anticipation is at an all time high and between the blinding strobes we can just make out the 3 headed beast known as Muse. It really couldn't have been a more fitting entrance has Spielberg masterminded the whole operation on a multi-million pound budget. The pomp rock behemoths start the show with "Apocalypse Please", all pounding drums and Matt Belamy resplendent behind his multi-coloured podium like a man possessed by the ambitious drive of Beethoven classically pounds away at his piano while Wolstenholme rumbles at the bottom end. The set sci-fi minimalism with a backdrop which projects images of sunset, out space and a Lord Of The Rings middle earth utopia and evoked a truly OTT rock opera which only enhances the breathtaking musical soundtrack. The video screens capture every minute detail of Belamy's musical expertise and it's exhausting to watch the multi-instrumentalist in action. "New Born", one of the singles of their last album gets a resurgence and the response is a revelation. "Butterflies And Hurricanes" proves just how much Muse have moved on and is testament to the bands dedication, ambition and sheer will power. 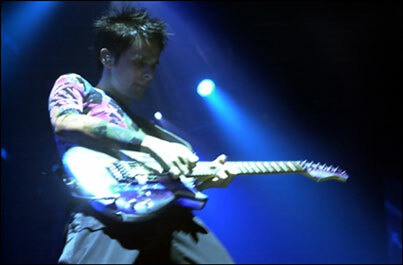 The dual attack of "Time Is Running Out" and "Plug In Baby", the latter with it's savage guitar solo and pulsating energetic edge, appears all too soon although in reality Muse have been on stage for a solid ninety minutes. Soaking the fans in champagne and releasing the white space pods around auditorium the atmospherics are give to becoming slightly less in your face as the band begin the encore with torch song "Blackout" which emphasizes Matt's remarkable vocal and the in your face rock workout of "Stockholm Syndrome" is a fitting end to an unforgettable and spectacular performance which saw them dipping into their back catalogue with "Sunburn" and Muscle Museum" as well as playing the high energy tracks from "Absolution". Nobody else in this country comes anywhere close to eclipsing the intensity and near religious experience Muse have in their live shows. They're unbeatable and in a class of their own.